Be fascinated by the attractions of this amazing Andean country and discover the great colonial treasures of Bogotá. Enjoy the lush coffee-growing region of Armenia. Visit the abundant Cocora Valley to discover it's biodiversity and natural beauty and marvel at the beaches and architecture of colorful Cartagena. International flights: US - Bogotá & Cartagena - US. 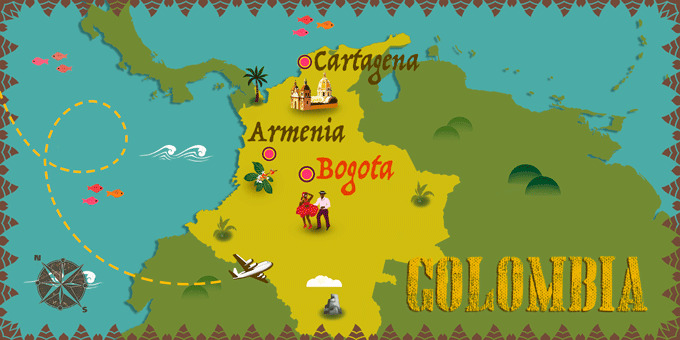 Domestic flights: Bogotá - Armenia & Armenia - Cartagena. * Possibility of booking optional excursions in the next step of the booking. Please note that all additional optional excursions which are not selected at time of booking must be requested before final payment is made at least 60 days before departure. The final price will be shown once you have selected the optional excursions, in the final step of the reservation process. Arrival at US departure airport ready to check in for a flight to Bogota. Arrival at the capital of Colombia and transfer to the hotel to rest. Overnight stay in Bogota. Breakfast at the hotel. Today, enjoy a panoramic and walking tour through the historical centre of Bogotá and its streets nuanced by colonial facades. Explore the Botero Museum to observe some of the most recognized art pieces by Colombian master, Fernando Botero. Continue the tour with a visit to the Plaza de Bolívar where you can admire the Palacio de San Carlos, La Casa of Nariño, the residence of the President of the Republic, the National Capitol and the Liévano Palace. Finish the tour with a visit to the Gold Museum, home to priceless pieces of Pre-Columbian goldsmith's art. Return to the hotel and spend the rest of the day at your leisure or enjoy an optional tour to the Salt Cathedral of Zipaquirá. * Overnight stay in Bogota. Breakfast at the hotel. At the indicated time, transfer to the airport to take a flight to the city of Armenia. Arrive and transfer to the hotel. Armenia is surrounded by the peaks of the Andes and is home to lively plazas and unique architecture. We recommend an optional tour of the Combia Inspiration Coffee Experience. * Overnight stay in Armenia. Breakfast at the hotel. In the morning set off to the Cocora Valley in Quindío. Appreciate the beautiful landscapes along the way and on arrival, enjoy a welcome cocktail. Explore the cloud forest and its biodiversity and discover ancient aboriginal Quindio wax palm rituals. Take the opportunity to plant palm seedlings before heading to the town of Salento to visit the Plaza de Bolivar and the Cocora viewpoint. Return to Aremina and overnight stay. Breakfast at the hotel. At the indicated time, transfer to the airport for a flight to Cartagena. Upon arrival, transfer and check in at the hotel. Cartagena sits on the coast and is one of the main ports in Colombia. It is becoming increasingly up-and-coming and has a plethora of quirky bars and eateries and is home to colorful streets and leafy plazas. Overnight stay in Cartagena. Breakfast at the hotel. Today, enjoy a panoramic tour of Cartagena, passing through the main neighbourhoods of the city: Boca Grande, Castillo Grande and Manga until you arrive at the majestic Castillo de San Felipe, an important feat in military engineering. Visit the Church of San Pedro Claver and end the tour with a short pedestrian walk through the walled area where you can admire its pretty squares, narrow streets and houses with balconies beautifully decorated with flowers. Overnight stay in Cartagena. Breakfast at the hotel. Spend the day exploring the city and its surroundings at your leisure or enjoy an optional tour to the Rosario Islands. * Overnight stay in Cartagena. 1 child under 10 years old can share a bed with their parents. Breakfast at the hotel. Enjoy a day at your leisure in charming Cartagena. We recommend exploring the city of Santa Marta on our optional excursion. * Overnight stay in Cartagena. Breakfast at the hotel. Enjoy another day in colourful Cartagena. We recommend relaxing in the tropical climate or, alternatively, enjoy an optional horseback riding experience along the beach. * Overnight stay in Cartagena. Breakfast at the hotel. Relax with another free day at your leisure, to shop for souvenirs, relax on the beach or to do some sightseeing in the old-town. We recommend an optional horseback ride through the historic centre. * Overnight stay in Cartagena. Breakfast at the hotel. Enjoy a final day in Cartagena, soaking up the friendly atmosphere and relaxing in the cafe-lined plazas. Perhaps head to the beach or watch the sunset from atop the city walls, where there are cafes to enjoy an authentic sun-downer drink. Overnight stay in Cartagena.